Of the original Indian tribes, perhaps least is known of the Pomos, of north­western California. According to legend­ary history they were created in Be-lo-ki (Oat Valley, now called Potter Valley). The food appointed for their use was fur­nished by the Coyote (God) from a conical, watertight basket; to this they fell heir. 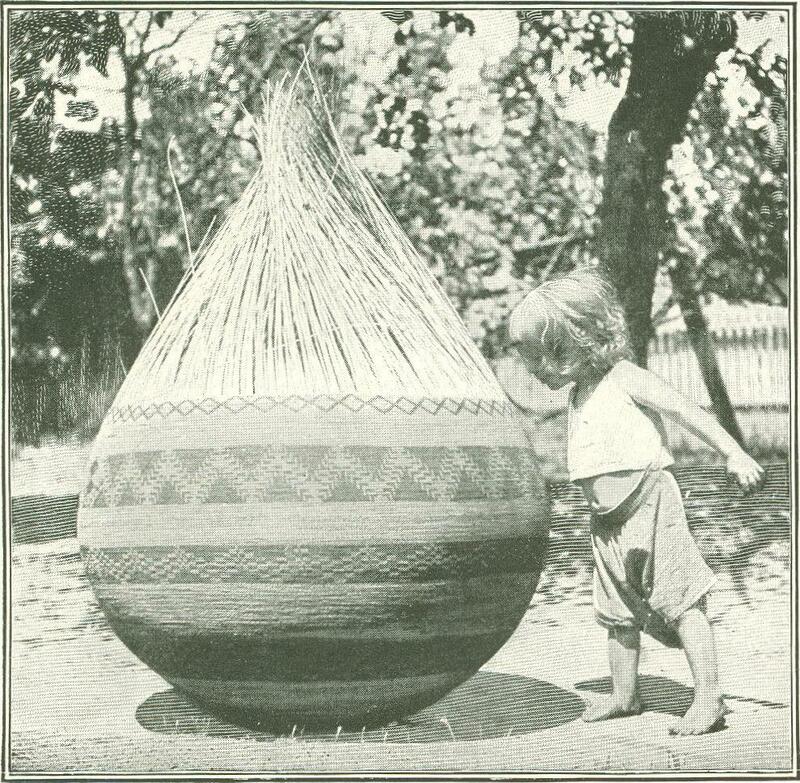 Beginning life with a piece of divine workmanship for a copy, it is not to be wondered at that to-day the world holds no more proficient workers in the art of basket-making. Unlike the nomads of the north and south, the Pomos have peacefully enjoyed the seclusion which the little mountain-encircled spot affords; plodding on through uneventful lives, doing what is positively necessary to their being, and devoting much time to sociability. The weaving of baskets is done more as a pleasant pastime than as labor, progressing slowly at odd intervals, much like a lady's piece of embroidery. The work is confined almost entirely to women of middle age. The young lack persistence without a goodly supply of which no Indian basket is ever finished. A touch of civilization renders the work more or less distasteful, and as their numbers are surely and steadily growing less, it becomes more difficult each year to procure specimens. A few years hence and they will be a thing of the past. Collecting material is slow and laborious. It is usually done in the summer and early fall. Since the whites own the country, the gathering even of common willows is attended with difficulty, as the farmer values them to prevent wash-outs. For the other necessary articles, jour­neys must be made to the mountains and canons, the lake and the seashore. 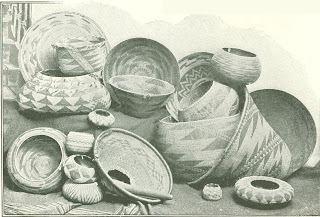 Baskets may be divided into three classes - the coarse burden-baskets, domestic baskets, and "family jewels"; seven different weaves being employed. 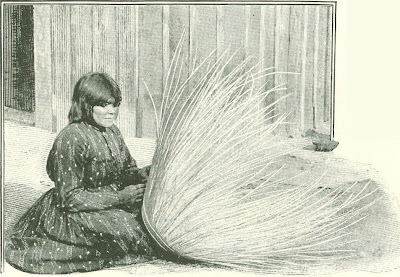 The large, coarse-meshed, conical bas­kets are made of the unpeeled willows, in what the natives denominate the psher­con (fish-net) weave, and answer all the purposes of a wheelbarrow or job wagon. 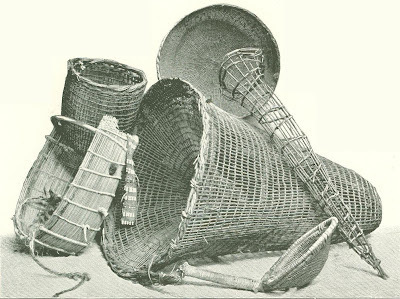 Of the same weave and material are baskets for trapping and carrying fish, but in shape they more closely resemble a well-filled Christmas stocking. And of the same nature is the granary basket, reaching three feet or more in diameter and about the same in height. These varieties are usually made by men who are too old to go out as day-labor­ers, and are the only kinds devoid of some sort of decoration, except a short-handled, frying-pan ­shaped affair, which is used in beating off the seeds of plants into closer-woven baskets. This last-named is the only basket to which a handle is attached, and lids, such as some tribes make, are not known. Willow shoots, stripped of the bark, are used in nearly all the weaves, to give shape and strength, while closely over them are wound and woven the roots of slough-grass (Carex Mendocinoensis), which form a groundwork color from a delicate cream to varying in light ocher. Baskets fill all the requirements of china, hardware, peram­bulators and trunks. Many of the baskets for domestic uses, and nearly all the finer decorated ones, are made in the coil weave, which gives great strength and almost the firmness of a wooden vessel. Three small wil­lows, side by side, are laid upon the last round; a stitch at a time the grass-root fiber passes over them solidly, beneath one willow of the previous round, the thread being constantly dampened in a cup of water - or, still more conveniently, in the mouth - before passing through a little opening made by an awl. All baskets of the coil weave are deco­rated with either the red-bud, stems of maidenhair fern (Adiantum), or bark from the roots of tule (Scirpus). The fern is most highly prized, because it is fine and naturally jet-black. The tule is the same color after being buried in wil­low ashes for several hours. The designs are conventional, rep­resenting in their crude way mount­ains, valleys, trees, quail, and very rarely figures of men and animals. When a continuous design runs around the basket, a little space may always be found which looks like a miscalculation. It is nothing of the sort, but left for the Evil Spirit to find an exit. In connection with these designs are feathers from the crest of the woodpecker, mallard-duck and quail, and from the breast of the lark, bluebird and oriole, unfailingly arranged with due artistic regard to harmony of color. 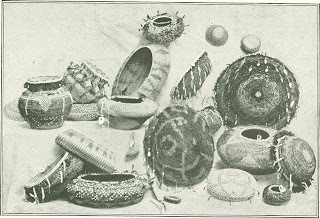 Such baskets, with pendants of beads tipped with elliptical bits of polished abalone shell (the conventional idea of a star), a frill of quail topknots, just beneath a line of milk-white wampum around the rim, are "family jewels," which after being carefully washed on the inside to insure the eyesight of the weaver, are suitable for matrimonial barter or funeral gifts.